Corporate Social Responsibility - Corporate Social Responsibility | What is CSR and why does it matter? Corporate social responsibility (aka CSR, corporate responsibility, sustainability, social responsibility, corporate citizenship, social impact, or sustainable business) is a form of corporate self-regulation integrated into the core business model. Corporate Social Responsibility is a form of corporate self-regulation integrated into a business model. CSR policy functions as a built-in, self-regulating mechanism whereby a business monitors and ensures its active compliance with the spirit of the law, ethical standards, and international norms. CSR is a process with the aim to embrace responsibility for the company's actions and encourage a positive impact through its activities on the environment, consumers, employees, communities, stakeholders and all other members of the public sphere who may also be considered as stakeholders. The term "corporate social responsibility" came into common use in the late 1960s and early 1970s after many multinational corporations formed the term stakeholder, meaning those on whom an organization's activities have an impact. It was used to describe corporate owners beyond shareholders as a result of an influential book by R. Edward Freeman, Strategic management: a stakeholder approach in 1984. Proponents argue that corporations make more long term profits by operating with a perspective, while critics argue that CSR distracts from the economic role of businesses. Others argue CSR is merely a window-dressing, or an attempt to preempt the role of governments as a watchdog over powerful multinational corporations. CSR is titled to aid an organization's mission as well as a guide to what the company stands for and will uphold to its consumers. Development business ethics is one of the forms of applied ethics that examines ethical principles and moral or ethical problems that can arise in a business environment. ISO 26000 is the recognized international standard for CSR. Public sector organizations (the United Nations for example) adhere to the triple bottom line (TBL). It is widely accepted that CSR adheres to similar principles but with no formal act of legislation. The UN has developed the Principles for Responsible Investment as guidelines for investing entities. It is becoming well documented that companies who have and CSR / Sustainability strategy and share it enjoy higher growth rates, more engaged employees and better stock values. 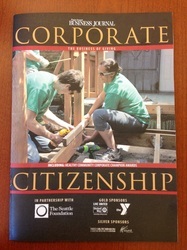 Giving back is a core pillar of corporate citizenship. Some companies have attributed unprecedented growth to giving back, including sweetFrog Yogurt. Companies that leverage strategic philanthropy perform well and more & more companies are focused on social impact, community impact, and collective impact. 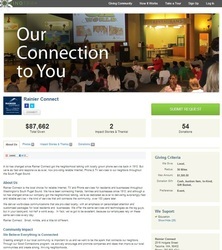 Contact us to learn more about how you can gain broader awareness of your CSR, Sustainability, or philanthropy programs. 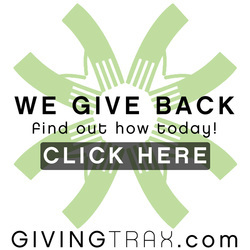 GIVINGtrax makes it easy to give back. Check out this 2 minute customer testimonial.